This indispensable context is how the section of Russian President Vladimir Putin's March 1, 2018, address to the Russian Federal Assembly, dealing with foreign policy and security, has to be understood. In what arguably stands as the most significant public address of the Russian president's tenure in the Kremlin, the world, particularly Washington, was left in no doubt that Moscow possesses the ability and willingness to meet any threat to its security that the US and its allies may seek to impose. Putin identified the decision of the Bush administration to withdraw from the Anti-Ballistic Missile Treaty in 2002 as the point when the US moved from a stance of mutual trust and respect in its relations with Russia to one of disregard and disrespect, exploiting Russia's internal problems during this period to assert its dominance as a unipolar power. "We did our best to dissuade the Americans from withdrawing from the treaty," the Russian leader announced. "All in vain. The US pulled out of the treaty in 2002. Even after that we tried to develop constructive dialogue with the Americans. We proposed working together in this area to ease concerns and maintain the atmosphere of trust. At one point, I thought that a compromise was possible, but this was not to be. All our proposals, absolutely all of them, were rejected." In a dramatic video presentation, the Russian president went on to unveil the next generation of the country's nuclear missiles, developed with the objective of circumventing and overcoming Washington's missile defenses and existing nuclear capability. The defiance with which Putin revealed the country's new and enhanced missile technology was unmistakable. It was perhaps illustrative of the years of broken promises, bad faith, duplicity and encroaching and enveloping military pressure exerted by the US and its allies against the Russian Federation. Returning to Cohen: "The most fundamental [error by Washington upon the demise of the Soviet Union] was to treat post-communist Russia not as a strategic partner but as a defeated nation, analogous to Germany and Japan after World War II." In contradistinction, in the parallel universe that Western hawks and neocons inhabit, responsibility for the breakdown in relations between Moscow and Washington is ascribed to "Russian aggression." It's a charge that throws up the question of what kind of aggression is it that sees US troops on Russia's border but no Russian troops Washington's border, US warships patrolling the Black Sea on Russia's shore but no Russian warships patrolling the Gulf of Mexico on theirs? And this is before we come to the missile defense shield deployed in Romania in 2016, or the attempt by Washington to use Georgia as its cat's paw in 2008 with the aim of NATO expansion, followed by Ukraine in 2014. What has been made abundantly clear by its actions since the early 1990s is that economic and military might is for Washington the first and final arbiter of international affairs. That we have arrived at such a parlous juncture in relations between East and West is, per Talleyrand, worse than a crime it's a blunder — an indictment of the conclusions drawn in Washington in response to the end of the Soviet Union. Here we are obliged to cite the sage lament of former US President Dwight D Eisenhower: "Every gun that is made, every warship launched, every rocket fired, signifies in the final sense a theft from those who hunger and are not fed, those who are cold and are not clothed." Yet guns, warships and rockets, more than diplomacy, have underlain US foreign policy since the day the hammer and sickle was lowered over the Kremlin. As for those 800 military bases established by Washington in 70 countries, are we really meant to believe they did so with the objective of making the world safe for democracy? Credulity, as they say, only stretches so far. Austrian political economist Joseph Schumpeter once described the Roman Empire thus: "There was no corner of the known world where some interest was not alleged to be in danger or under actual attack. If the interests were not Roman, they were those of Rome's allies; and if Rome had no allies, the allies would be invented. When it was utterly impossible to contrive such an interest — why, then it was the national honor that had been insulted. The fight was always invested with an aura of legality." Substitute Washington for Rome in that passage and you have yourself the nuts and bolts of America's relations with the world throughout the era of unipolarity. Putin's address and unveiling of Russia's advanced nuclear missile capability provides empirical evidence of the failure of US and Western foreign policy since the Soviet Union was consigned to history. Rather than embrace this world-historical event as an opportunity for peaceful coexistence, for stability and cohesion, the US sought to impose on its former Cold War adversary a Carthaginian peace. And lest anyone forget what this Carthaginian peace entailed for Russia's people, Canadian journalist Naomi Klein's "Shock Doctrine" is required reading: "By 1998, more than 80 percent of Russian farms had gone bankrupt and roughly 70,000 state factories had closed creating an epidemic of unemployment… By the time the shock therapists [of the West] had administered their ‘bitter medicine in the mid-nineties, 74 million Russians were living below the poverty line, according to the World Bank." When we consider that in 1989 the number of people living in poverty in Russia was 4 million, we are left with the monstrous fact that the free market economic reforms imposed on Russia in the 1990s led to the impoverishment of 72 million people in less than a decade. 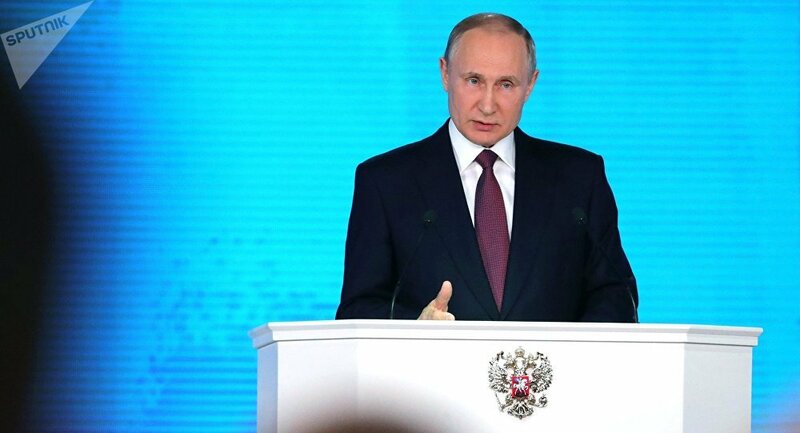 Given this history and given Moscow's repeated attempts to reach a modus vivendi with the West, Putin's address to the Russian Federal Assembly was that of a leader left with no choice other than to adapt to the verities of a US hegemon, for whom peaceful co-existence is anathema. Thus, for Russia, it is now a case of meeting might with might. The views and opinions expressed by John Wight do not necessarily reflect Sputnik's position.